This entry was posted in Real Estate and tagged Real Estate, residential real estate on July 31, 2013 by Ted Kavadas. 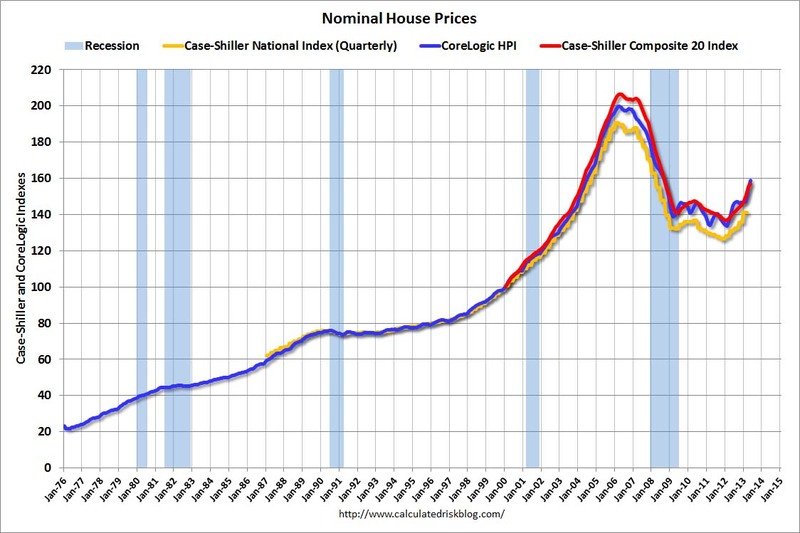 Doug Short, in his July 29 blog post, titled “Real Median Household Incomes: Up .7% in June But Only .1% Year-over-Year” produced the chart below. It is based upon data from Sentier Research, and it shows both nominal and real median household incomes since 2000, as depicted. As one can see, post-recession real median household income (seen in the blue line since 2009) is especially worrisome. This entry was posted in Uncategorized and tagged Household Income on July 30, 2013 by Ted Kavadas. 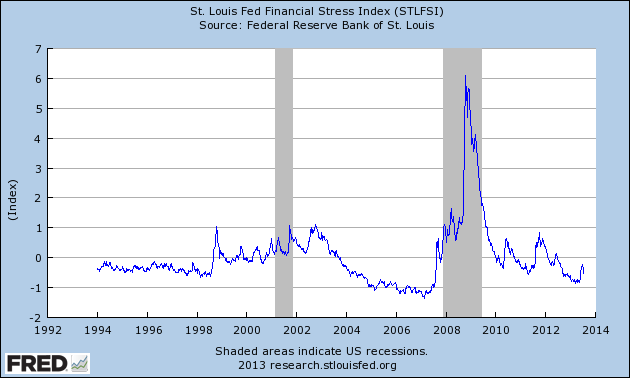 This entry was posted in Uncategorized and tagged Consumer Confidence on July 29, 2013 by Ted Kavadas. 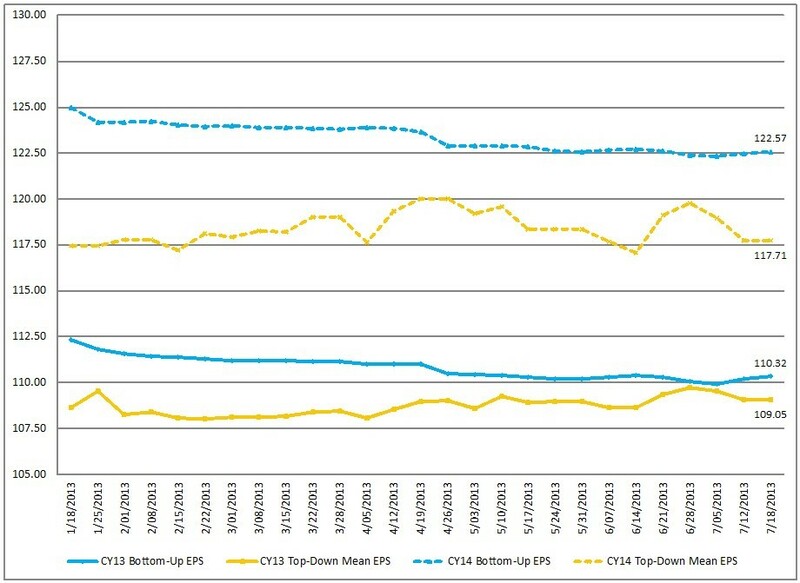 Below are three long-term charts, from Doug Short’s blog post of July 26 titled “ECRI Recession Watch: Weekly Update” These charts are on a weekly basis through the July 26 release, indicating data through July 19, 2013. 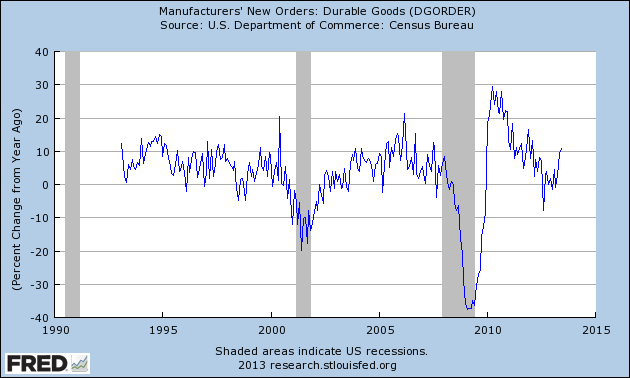 This entry was posted in Economic Forecasts and tagged ECRI on July 26, 2013 by Ted Kavadas. This entry was posted in Economic Forecasts and tagged Economic Forecasts, economic indicators, STLFSI on July 26, 2013 by Ted Kavadas. 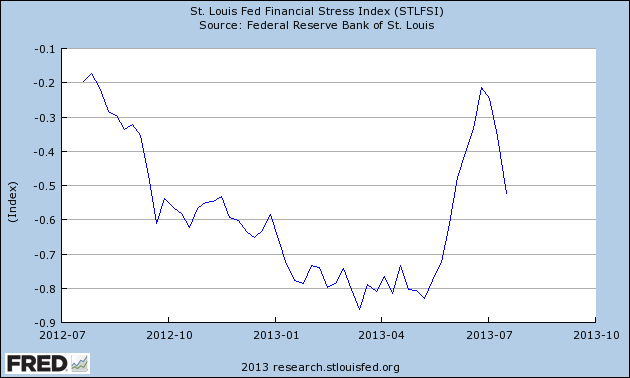 This entry was posted in Uncategorized and tagged economic indicators on July 26, 2013 by Ted Kavadas. Corporate earnings and earnings growth is a particularly notable subject at this time. 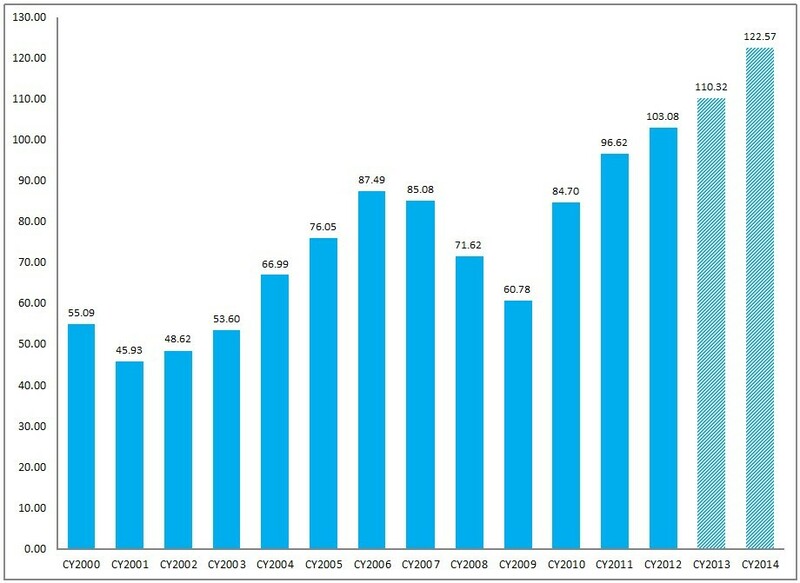 As I wrote in the blog post of June 11, 2013 (“The Current High Levels Of Corporate Profitability“) current various levels of profitability – including the S&P500′s operating margins, operating profits, EPS, and After-Tax Corporate Profits as a Percentage of GDP – are at or near record-high levels. Furthermore, as seen in a variety of aggregate S&P500 earnings forecasts, S&P500 EPS growth for years 2013-2015 is projected to be fairly robust. I’ve discussed the threat of deflation in a variety of recent blog posts, including the July 11, 2013 post titled “Would Deflation Be Beneficial?” as well as the June 10, 2013 post “The Prospect Of Deflation.” While none of the recent various business surveys (or economist surveys) indicate that businesses expect oncoming deflationary conditions, whether businesses would foresee – and successfully adapt – to such deflationary conditions remains to be seen. 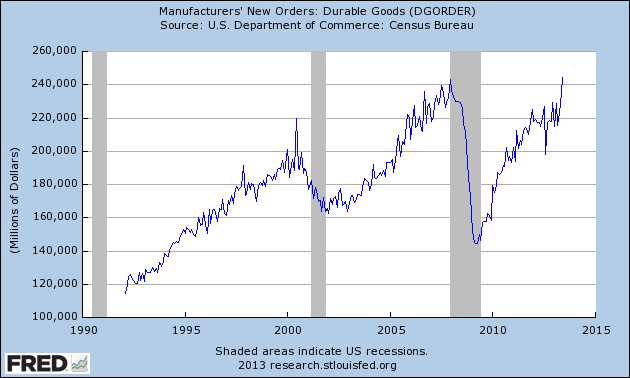 It appears as if businesses aren’t assessing and/or planning for a deflationary environment. Should deflationary conditions occur – and I believe deflationary conditions are on the horizon – the impact on businesses’ revenues and profitability would likely (depending upon the extent of the deflation as well as other factors) be pronounced. Deflationary conditions, along with likely accompanying significant declines in aggregate demand, would likely highly impact revenues and profitability. Persistent weak revenue growth – and even revenue declines among various companies – has been an ongoing problematical characteristic since 2009. While this overall weakness in revenue growth has coincided with substantial aggregate growth in profitability, this weakness in revenue growth is cause for concern on many fronts. While economists continue to predict 2013 GDP will come in above 2.0%, there appears to be a growing consensus that 2nd quarter GDP will be (at most) 1%. International economic growth, in many instances, is also predicted to be weak or weakening. Of course, actual GDP growth can come in above or below these forecasts, but for a variety of reasons I believe that even these GDP forecasts will prove overly optimistic. There are many other factors that have positively impacted profitability, some of which I mention in the above-referenced June 11 blog post. Also in that blog post, one can see how “stretched” overall profitability is to GDP from a long-term perspective. One critical question is whether such historically high levels of profitability represent a new structural era in which such high levels are sustainable, or whether such outsized profitability is anomalous and will (at minimum) mean-revert. I strongly believe that, from an all-things-considered basis, the latter will prove true, which will have an outsized negative impact on profitability. This entry was posted in Business and tagged Business on July 25, 2013 by Ted Kavadas. This entry was posted in Investor, Stock Market and tagged S&P500, S&P500 Earnings, Stock Market on July 25, 2013 by Ted Kavadas. This entry was posted in Investor, Stock Market and tagged S&P500, S&P500 Earnings, Stock Market on July 24, 2013 by Ted Kavadas.